Every once in a while, I see I figure and have a idea for something that causes me to want to get it. In this case, it was two ideas. Back when I started TVFT, each page was it’s own file and edited the home page by hand. Don’t judge me, it worked at the time. Beside the text I used a rotator to feature a different action figure picture and every time the page reloaded a different figure would be shown. I always like that, but I doubt anybody else really misses it. 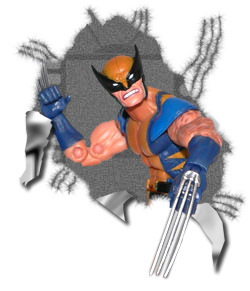 I actually had the idea of the a Wolverine ripping out of the screen, then went looking for what ever variation was on the pegs at the time. The desktop wallpaper above was a second idea that I had on whim when I saw him. 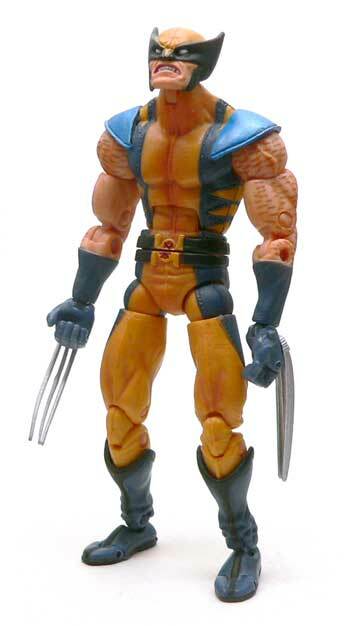 There have been a number of Wolverine variants over the years. Blue costumes, brown costumes, black costumes, etc… To say that any one figure truly embodies a character with a fluidly changing costume is impossible. 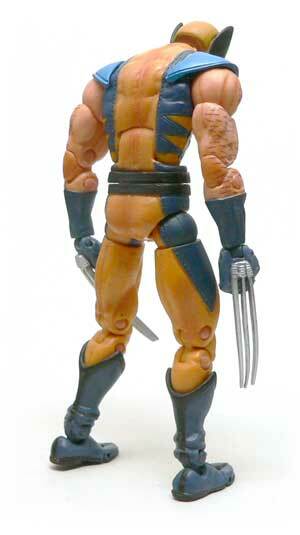 However, this Wolvie does embody all the things I personally think of when I think of the angry mutant. The first is the head. There is no mistaking that he is not happy about something. His teeth are bared in a grimace that shows he means business. There a couple of other details I love about this particular head, though. The nose is small, and it’s blended into the mask to give that “no nose” impression that some art work gives him. I also love the fact his eyes are white. they didn’t try to paint eyes in where there shouldn’t be. The last thing I love is the seam to the middle of the mask. Does it need to be there? No. It does add quite a bit of real world detail to this comic book character, though. The body is a blue tiger stripe affair with some add on shoulder pads. Again it’s the little details that help. There is a seam sculpted down the middle of the suit, presumably a zipper in the front. But, there’s also stitching line for almost all of the blue details like they are separate costume pieces on top of the main yellow portion of the suit. The little detail like that really helps a figure in this scale with realism. The one thing I don’t like about this figures body? The X Belt. It seems kind of retro looking, which doesn’t bother me. That fact it is split in half by the waist joint and never seems lined up right does. It would have been much better if the belt was an extra piece that covered up the joint and didn’t move. Three things stand about his arms; muscles, hair and claws. Wolverine has always been drawn as muscular so there’s no really surprise that he’s ripped here. I’m not even surprised that he’s depicted as being hairy. Logan has always struck me as a character that would have back hair you could braid. What I don’t care for are the little lines used for the hair. They just don’t look good. They don’t look like hair at all. And they are only on one side of his arm. Well, I guess mutants only grow hair on one side of their limbs. One of small things I don’t like about these particular claws is that the attachment points are all silver. A little blue here between them to match the gloves would have went a long way. Speaking of the paint, that is one area that this figure is a bit of a let down. In general, the colors don’t match real well. The yellow on the head doesn’t match the body. The blue on the body doesn’t match the shoulder pads. The gloves and boots match each other but not the body. From a couple feet away, he’s not bad. But, you can see it if you are handling him. 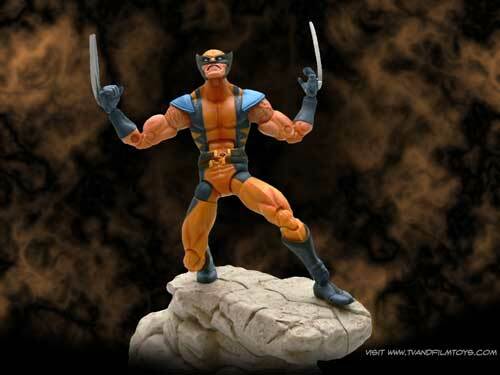 Marvel Legends are known for their blend of articulation and sculpt. Logan here is no exception. I almost wonder if he is too articulated. This is one of those figure you pick up and it just kind of goes all wonky on you. 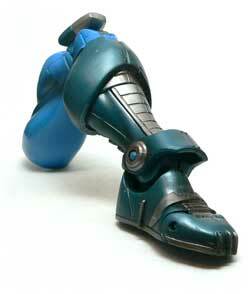 There is so much articulation, that he bends and swivels everywhere. My two areas of biggest concern are the feet and hands. The feet have that funky toe articulation Spider man figures are famous for. I understand it’s use. But, combined with the tiny ankle those are some ugly feet to look at. The hand articulation I just don’t get. His fingers are balled up in fists, but they are jointed where his knuckles would be. Who moves their hands like that? Besides, the claws should come between his fingers, They should be able to rotate under them. I think he would have been better served by less hand articulation but a swappable pair of hands with retracted claws. I’ll also add that the chest and waist joints are extremely loose on my Wolvie and were that way out of the package. This gives him a pretty much constant hunched over look. I can see from this figure why there are so many Marvel Legends fans out there. Solid sculpting and lots of articulation are what figures collectors want in an ideal plastic hero. Wolverine here is a good representation of this character, and well how could you really go wrong? Well, yeah I forgot about that ToyBiz Patch figure…. Really neat figure. I like that they didn’t give it a super bright yellow suit. Definitely one of the best Wolverine figures in this scale. I’m glad I was a bigger Star Wars collector at the time, or I could have been totally sucked into Marvel Legends.